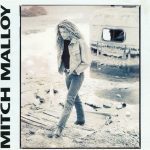 Mitch Malloy is the self-titled debut album by AOR singer-songwriter Mitch Malloy. It featured 11 songs, all of which were co-written by Malloy himself and produced by engineer Sir Arthur Payson (according to Malloy, it was the first album Payson had produced on his own without his mentor, Desmond Child). The record’s first single, the hard-edged, up-tempo rocker “Anything at All” became a top-20 hit on the US rock charts, and was a hit on the Billboard Hot 100 reaching #49 on June 6, 1992. It also had a rather popular music video, which was featured on MTV’s Headbanger’s Ball. The album’s second single, “Nobody Wins In This War” peaked at #66 on Billboards Top 100 with the third single, “Our Love Will Never Die,” promoted on The Jay Leno Show. Pressed By – Disc Manufacturing, Inc.